Showcasing the creative process of bringing new Disney park experiences to life, Walt Disney Parks and Resorts invites guests to discover its D23 Expo 2017 pavilion, “A Galaxy of Stories.” “A Galaxy of Stories” will be accessible through the Expo July 14–16 at the Anaheim Convention Center and will offer guests an exclusive look at the new Star Wars-themed lands currently under development for Disneyland Park and Disney’s Hollywood Studios at this year’s pavilion. Guests to the pavilion will also hear personal stories of cast members and Imagineers working to create transformational experiences every day at Disney Parks. 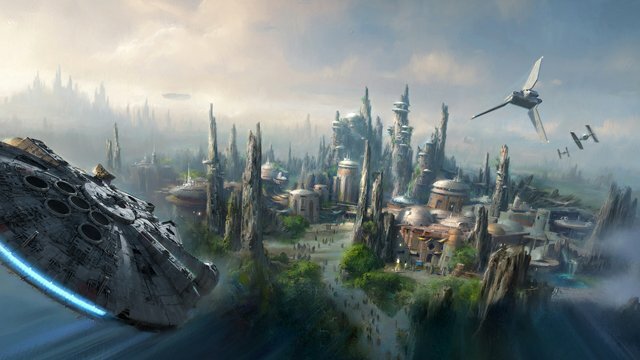 Showcasing models, artwork, and media, “A Galaxy of Stories” will provide a first-ever look at some of the locations, starships, creatures, and droids that will bring Star Wars to life at the new themed lands, which are set to debut in 2019. For the first time, guests will be able to view a fully detailed model of the overall vision for this new experience that was once “far, far away,” but is now very, very near! D23 Expo guests will once again have the chance to explore Mickey’s of Glendale, an Imagineering-exclusive merchandise store, to shop for unique souvenirs, specialty pins, limited-edition collectibles, and merchandise not available anywhere else. From its early origins at Disneyland Park to the latest technical achievements of Pirates of the Caribbean: Battle for the Sunken Treasure at Shanghai Disneyland, Imagineers will share buccaneering tales of developing this signature Disney Parks attraction around the globe. Meet some of the talented women of Walt Disney Imagineering. Guests will hear personal stories and get an insider’s look at the Imagineering process from these creative and technical professionals building on Disney’s rich legacy of female Imagineers. See—and hear—the people behind some of the most recognizable voices heard across Disney Parks. From famed attractions to favorite characters, these talents have done it all, and guests will hear personal stories and feel as though they’ve stepped into a Disney Parks recording booth! Tickets for D23 Expo 2017 are available for $81 for one-day adult admission and $59 for children 3–9. Members of D23: The Official Disney Fan Club can purchase tickets for $72 for a one-day adult admission and $53 for children 3–9. Multi-day tickets are also available.